After a cold day of gorgeous sunshine on the last Saturday of January, on Sunday 1st February snow was the order of the day. But, a few snowflakes were not going to deter around 15,000 festival-goers who arrived at the tiny neighbouring villages of Passenans and Frontenay in the Jura, France for the 13th Percée du Vin Jaune. Saturday had seen a record 19,000 visitors on Saturday – usually the quieter day of the weekend festival that celebrates the most celebrated wine of the Jura – Vin Jaune. La Percée du Vin Jaune is a glorious winter wine festival, held every year over the first weekend of February in a different town or village. This was my fourth Percée and as always the villages were superbly decorated, the atmosphere joyous, and it was a delight to mingle with the crowds wandering up and down the streets. Fans of Jura wine arrive from far and wide to taste all of the wines of the Jura and, on Sunday, to celebrate the official release of the latest vintage of Vin Jaune, this year the 2002 vintage. Why so old? Well, this peculiar wine of the Jura is not allowed to be sold before six years and three months after the vintage and most of this time it spends in un-filled barrels. To hear me explaining a little more about this mysterious and revered wine, check out my recent interview with Chris Scott of the UK Wine Show. For the Percée 2009, the organisers – the grandly named Ambassadeurs du Vin Jaune – chose music as an extra theme, and there were several areas where visitors could enjoy jazz of all genres in-between tasting wines from around 80 Jura vignerons. The Sunday morning events start with a procession to church to bless the symbolic barrel of Vin Jaune, and then continue after the service with a ceremony and speeches in front of a huge expectant crowd who wait with their glasses raised to receive their first taste of the latest vintage. In line with the music theme, this year the ambassadeurs invited as guest of honour a jazz musician – Tom McClung, an American living in Paris, whose task it was to break the seal of the barrel. But, before he could do that, he sat down at the piano to give the crowd a song. To the tune of ‘My Bonny lies over the Ocean’ he sang, in French with an American twang, a homage to Vin Jaune and to the Percée festival, and he succeeded in getting the whole crowd singing along while the snow came down. Brilliant! Over our long weekend we used the time also to discover some new restaurants for the Jura region guides on the website and discovered a couple of gems – on Thursday night we went to Le Mirabilis in a village about 15 minutes’ drive from Lons le Saunier where we drank a gorgeously fruity Poulsard 2003 from Jacques Tissot. During the Percée itself we had lunch with the press group at a new little café in Passenans called Le Bistrot de la Mère Simone – you can see a fine pictorial record of the whole event from Maxim, a young French radio internet journalist we met there. Next year, La Percée is due to take place in the town of Poligny in the centre of the wine region half way between Arbois and Lons le Saunier. However, a new law proposed recently by the French government and designed to combat student binge drinking, has put the very existence of this wine festival under threat – read more about this ridiculous situation on my personal blog. It would be a real tragedy for the little wine region of the Jura if this annual festival was blocked by the bureaucrats. In the meantime, the Jura wine region remains a great place to visit especially in summer – last year the Jura wine route won a top award, namely the “Destination touristique européenne d’excellence”. There are two wine travel guides to the region, which reflect my own passion for this extraordinary little area of obscure wines, glorious scenery and warm people. 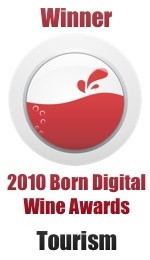 This entry was posted on Monday, February 9th, 2009 at 10:02 am and is filed under Wine Tourism General. You can follow any responses to this entry through the RSS 2.0 feed. Both comments and pings are currently closed.